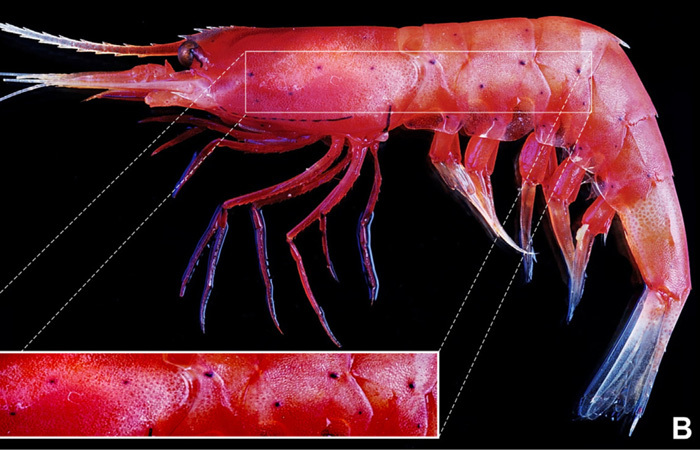 FIU researchers have traced the evolution of bioluminescence in deep-sea shrimps. The study, led by marine scientists Juliet Wong, Jorge L. Perez-Moreno and Heather Bracken-Grissom in the FIU Department of Biological Sciences, is the most comprehensive study of evolutionary relationships between deep-sea shrimps to date. Specimens were collected from the Gulf of Mexico, North Atlantic Ocean, Spain, Vietnam, the Philippines and Taiwan and comprise 30 species of deep-sea shrimps. Bioluminescence is the production of light by a living organism and essential to survival, particularly in the deep sea where light is limited. Bioluminescence in the deep sea is greatly understudied due to the difficulties associated with conducting research at great depths and to the challenges associated with collecting specimens without damaging them as they are brought to the surface. Composite showing secretory luminescence as a defensive mechanism. Photo by Edith Widder. Deep-sea shrimps exhibit bioluminescence in two ways — a blue secretion from the mouth used for predatory defense and organs that emit light along the length of the body, including the eyes, limbs and abdomen. It is believed the light-emitting organs may have evolved in species that tend to inhabit shallow waters, where sunlight from the surface would be more prominent in the water and where glowing would allow them to camouflage from predators. By looking at the traits in present-day species and tracing them to a common ancestor, the researchers found secretory bioluminescence has a single evolutionary origin and most likely arose in a common ancestor. Close-up showing photophores, or light-emitting organs. Photo by Tin-Yam Chan. 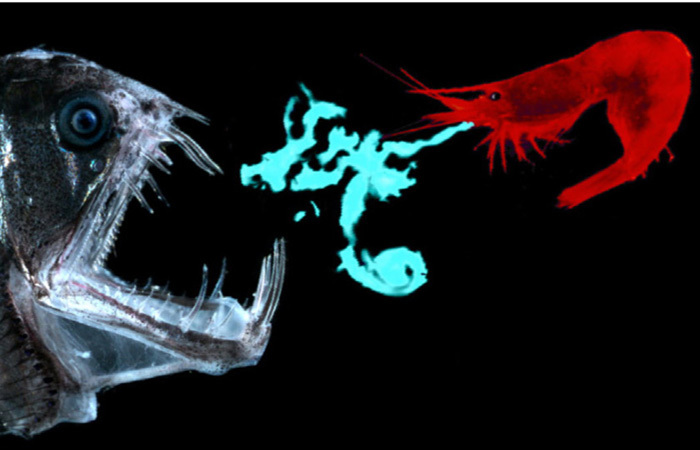 The researchers investigated how the vision of deep-sea shrimps exhibiting both light-emitting organs and secretory luminescence differ from those with just secretory bioluminescence. In the deep sea, the only forms of light are bioluminescence and dim sunlight from the surface, most commonly peaking in the blue spectrum. Therefore, most deep-sea species have one photopigment that is sensitive to blue-green light. They found deep-sea shrimps with both secretory and photophore bioluminescence have two photopigments making them sensitive to both blue-green and near-ultraviolent (near-UV) light. “This was a very exciting finding as in a way it supported the hypothesis these shrimps might use their photophores for counter-illumination, and thus needing to able to detect near-UV light coming from above as well,” Perez-Moreno said. The researchers advocate the further study of bioluminescence and light-detecting capabilities of these shrimps and other deep-sea organisms.